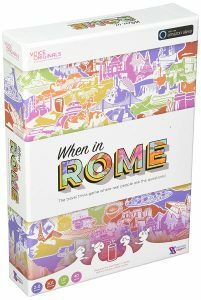 Last night, I played When in Rome, the world’s first voice-augmented board game for Amazon Alexa. Voice Originals did a great job. The box is of high quality and the companion Alexa Skill is well developed. So, if you would like to have an entertaining evening with an Alexa guided board game, it’s a great choice. The game starts nicely, as there is no need to read a manual: Alexa explains everything and guides you thought the game. It feels like playing an interactive adventure, but with gaming features. The story itself is well produced with lots of variety, different voices and background music. The game questions are also interesting and fun, but unfortunately the storyboard was not terribly engaging, and therefore the narration sometimes felt a little tedious. One of our conclusions from playing the game, is that Alexa is not a very good storyteller or gamemaster. Common voice-assistants simply lack the dynamics and struggle to improvise. No complaints here, as we understand that this is simply a technical limitation. For instance, you always have to say “Alexa, do this or that” to interact. After shouting “Alexa” dozens of times, it did start getting annoying. Because of that repetition, I even accidentally called my son “Alexa” which was quite embarrassing and disrupted the flow of the game.